Workman Publishing Company, 9780761154570, 314pp. Here's the problem: 17 million Americans suffer from heart disease, and every year 1 million of them will be just lucky enough to survive a heart attack. They know they must change their lives—their diet, their stress, the amount of exercise they do. And not for a few months, but forever. Most don't do it. What they need, as much as low-fat recipes and fitness plans, is daily motivation—a reassuring yet no-nonsense guide to staying the course to heart health. 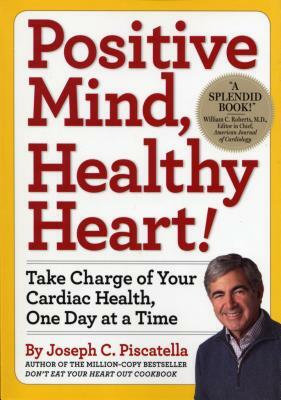 Here's the solution: From Joseph C. Piscatella, one of the longest-surviving bypass patients in the U.S.—31 years and counting—comes a supportive, generous, think-positive book that shares the secret of his extraordinary success. This is the stuff that kept Joe going—a year-long selection of motivational stories, inspirations, quotes, wisdom, meditations, tips, and more. When it's 5:00 A.M. and raining outside and you're tempted to skip that morning jog, remember "runner" Bob Ireland, a Vietnam vet who lost both legs in the war yet finished the New York marathon using only his arms, the first person ever to do so. Think little things don't make a difference? Take a lesson from golf: An average of less than 1.5 strokes per round in the 2002 season made a $5.6 million difference in earnings between #1 golfer (Tiger Woods) and #10 golfer (Sergio Ggarcia). And why a book of everyday entries? "People often say that motivation doesn't last. Well, neither does bathing—that's why we recommend it daily. "—Zig Ziglar. Author Joseph C. Piscatella has been a keen observer of American eating habits since 1977, when emergency open-heart surgery at the age of 32 forced him to recognize the intimate connection between dietary habits and overall health. His successful recovery and determination to make adjustment in his own lifestyle and diet inspired a new career as an active proponent of healthy lifestyle changes. As president of the Institute for Fitness and Health, Inc. in Tacoma, Washington, he lectures extensively to a variety of clients, including medical organizations, corporations and professional associations, and is a consultant on major wellness projects for Fortune 500 companies, the U.S. Army, U.S. Navy and U.S. Air Force. Cited in Time for their practicality and effectiveness, his seminars deal with the management of lifestyle habits to increase health, longevity and productivity. Mr. Piscatella is the only non-medical member of the National Institute of Health Cardiac Rehabilitation Expert Panel, which develops clinical practice guidelines for physicians. He is also a member of the Association for Worksite Health Promotion, the American Association of Cardiopulmonary Rehabilitation, and the National Wellness Association.